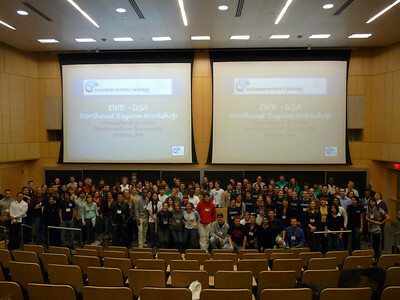 Thanks for a successful NER Workshop 2009!! Thank you to all who attended the 2009 Northeast Region Workshop. Your participation, energy, and enthusiasm helped make the first Northeast Region Workshop a huge success! More than 275 participants attended this year's event at Northeastern University, with more than 40 breakout sessions and 30 speakers to inspire, energize, and connect the 55 chapters from Maine to Delaware. For those of you who attended, professional development hours (PDH) are available for all of the sessions. Please contact workshop@ewb-northesat.org for more information. To "continue the conversation," feel free to participate in the new forum. For workshop PHOTOS, visit the EWB-NEU photo website. As this year's events come to a close for EWB, we look towards 2010 as an opportunity to grow and learn from our member chapters and projects, and we need everyone's participation to make that happen. As many of you heard on Sunday, we will be contacting all chapter admins within the next week as a call for nominations to NER Secretary, Treasurer, and many State Representative positions. These are not easy roles, and do require the dedication of an EWBer who is committed to our cause. As Cathy mentioned on Saturday night, who out of all of you will be here in 5-10 years? I strongly encourage all of you to think about who in your chapter/project has what it takes to help lead our Region forward in the coming years. Nominations should be sent to Bree at president@ewb-northeast.org. For more information on any of the open positions, please contact Julie at vicepresident@ewb-northeast.org.